Camping has always been one of kids favorite activities. Hence, my lifting of the 1964 Alan Shermann song seemed an appropriate fit for this post’s title. Earliest records show that girls attended camps as early as 1917 in the Washington-Metropolitan Area. In 1935, the Prince George’s County Girl Scout Council was chartered from the Washington, DC Council. This was the same year that John Byron Plato at age 58, (Born 17 Dec 1877, Geneva, IL- Died 29 Jun 1966, Forestville, MD) migrated from Ithaca, New York’s American Rural Index Company, to Forestville, Maryland where he had accepted a position as a special agent with the U.S. Census Bureau and worked at the Suitland Federal Center in Suitland, a town adjacent to Forestville. On July 27, 1915, this Colorado dairy farmer, J. B. Plato, received a patent for his “Clock System” Rural Index. Patented schemes for identifying rural places peaked well before patents addressing travel mapping and even map folding. These schemes provided an alternative to the Public Land Survey System, and one anticipated by eight decades the “quadtree” data structure adapted for digital mapping in the 1970s. Particularly emblematic was John Plato’s Clock System that gave rural residents “real addresses” just like their urban counterparts. Twelve sectors defined by lines radiating from each locally important central place were superimposed on concentric circles a mile apart, which divided the surrounding area into “blocks.” All residences within each block were assigned a unique number or letter to produce a rural address, which was listed in a “rural directory” published along with a map. Link to John B. Plato’s original patent submission. In 1948, John Plato married Christine Grieling, 10 Jul 1900 – 2 Apr 1991), who was nearly 24 years his junior. So, you may ask, and quite appropriately so, what’s John’s connection to campgrounds and the Girl Scouts. It was, in fact, this John Plato (aka “Uncle John” Plato), who donated 50 acres of his woodland property in Forestville and created and run a nature preserve with three artificial lakes. He next donated this property equally to local Girl Scouts and Campfire Girls. John Plato lived to be 89 years old and was buried in Forestville’s Forest Memorial Cemetery, part of the Forest Memorial United Methodist Church. 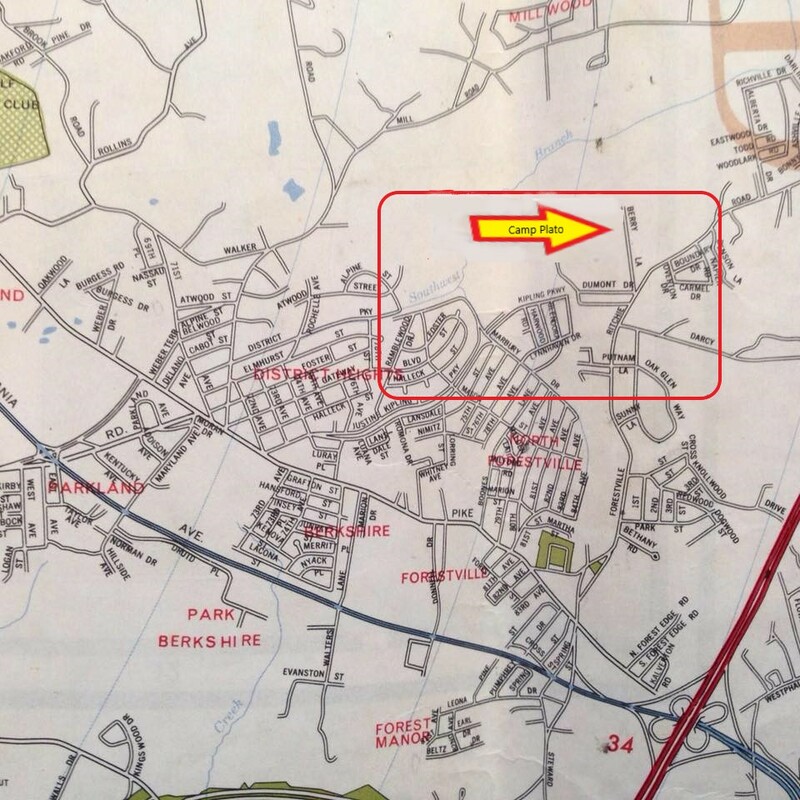 Camp Plato Place, as it was called, was located off of Berry Lane (which was west off of Ritchie Road), in Forestville. It had a log cabin with a cement floor, a large cement Turtle Hollow circle for campfires with block walls for seating, and a tenting area where Iris, Pipsissewa and Birdhouse plants grew. 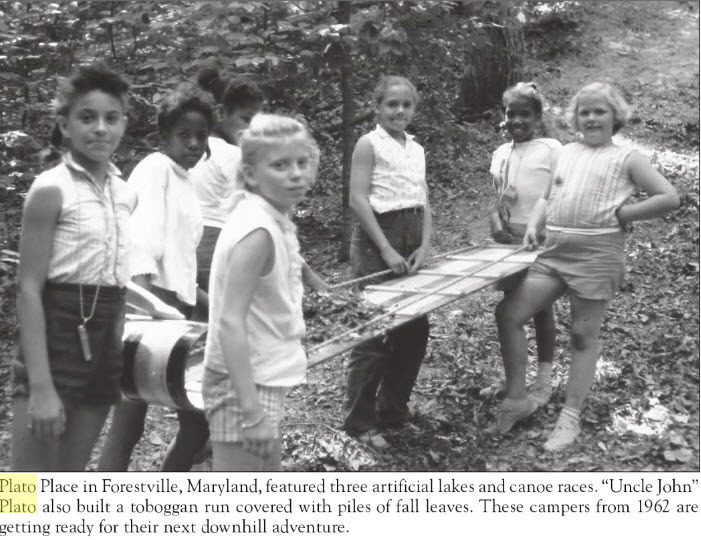 In 1962, Camp Plato had three artificial lakes and canoe races. “Uncle John” Plato built a toboggan run covered with piles of fall leaves. The left image, above, shows some Camp Plato girls as they are getting ready for the downhill toboggan run. The image beside this one, on the right, best shows the camp’s full layout. The Associated Press’s 1966 news article on the left reports on ongoing and increasing vandalism at Camp Plato. The Prince George’s County Police, according to the article, attributed these incidents to teenagers and younger children of the local neighborhoods that surrounded the camp. 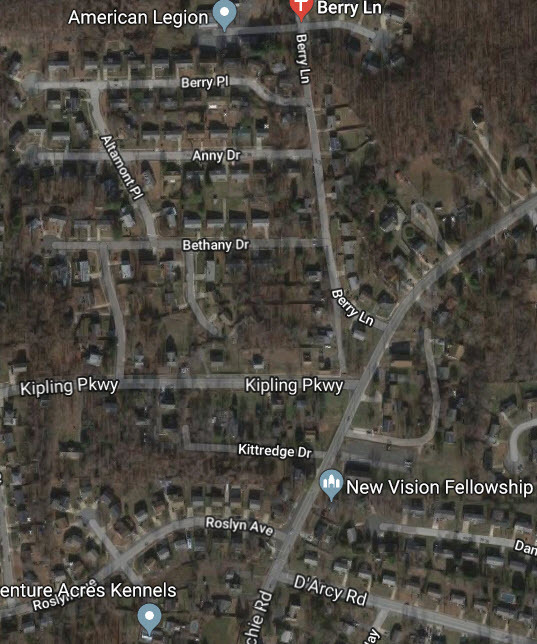 As you can see in the satellite map, some of the primary roads that surrounded the camp were Ritchie, D’Arcy, Roslyn, and Kipling Parkways in District Heights–my hometown in those days. 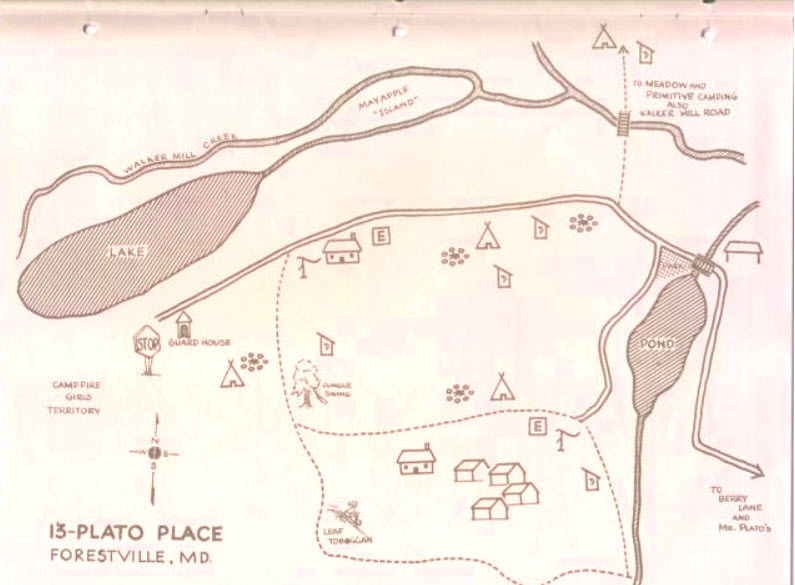 In 1974, the Camp Plato Place property was exchanged for Aquasco Farm, now known as Camp Aquasco. I LOVED that teepee! And there was a circle of logs around the campfire site to use as seats. And the Lodge!!! I loved sleeping there. And I loved being a Camp Fire Girl!! My mom distributed cookies and camping equipment. My mom and dad went around to different campgrounds and repaired the platform tents. They were really involved. Yes. Plato Place was at the end of Berry Rd. Used to go there with the Girl Scouts. I remember when the Platos were still alive. We lived up the street. It was our playground. Doubt that it is safe to let kids run free these days. Back in the 70’s, I would ride my horse back there. Still had the teepee. The pond/ mini lake that had a rope swing was dried up. Perfect place for kids! Very generous guy. Not all have such fond memories of camp Plato. Crimes did happen there. There is an unconfirmed story that one or more girls in the 1940’s were murdered here. I’m wondering if the murders of girl scouts at Camp Scott in Oklahoma City became the story of Camp Plato over the years? Yes, the local teenagers did gather regularly in the evenings to have their own campfires and adventures. This is the top!!!! Wow! Memory Lane. Thank you for this great research. I forwarded it to a friend in California whose mother was a Girl Scout leader. I loved this camp. I have driven back there over the years and have seen the sad dismantling of it. I have a photo taken several years ago of Plato’s former house. I don’t know how to upload it here. He used to come out if the house and talk to carloads of campers. What a nice man. Gone but not forgotten. MNCPPC owns much of the camp now. They own where Walker’s Mill used to be across the road, as well. I am sure you are doing much more thorough research than this, Joanne.